Schedule for United States Tour . . .
February 23, 2005: Harvard University, 7:00 PMAustin Hall, West Room, 1563 Massachussetts Avenue, Cambridge MA.Sponsored by NECDP and Justice for Palestine (http://www.law.harvard.edu/students/orgs/jfp/).With Producer/Director Buthina Canaan Khoury. 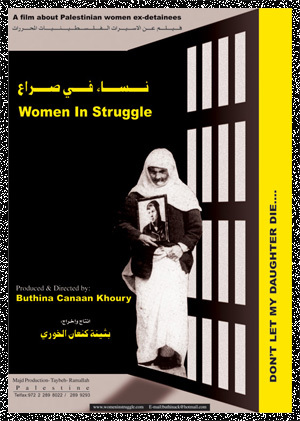 February 24: Massachusetts Institute of Technology, 6:00 PMMIT, 77 Massachusetts Ave., Room 6-120.Sponsored by NECDP and MIT Social Justice Cooperative (web.mit.edu/justice/www).With Producer/Director Buthina Canaan Khoury. February 25: Clark University, Worcester, MA, 5:30 PM, Jefferson Building,Room 218.Sponsored by NECDP and PRAXIS (http://black.clarku.edu/~dsinha/praxis/).With Producer/Director Buthina Canaan Khoury. February 27: Rutgers University Women's Center, Third Floor, Douglass College Center. 100 George St., New Brunswick, NJ, 7:00 PM. Film showing and presentation..
February 28: Rutgers University Law School, Room 125, 123 Washington St.Newark, NJ, 3:00 PM. February 28: St. Mary’s Church, 521 W. 126th St., New York, NY, 7:00 PM, Political Prisoners Solidarity Evening featuring film showing and talk with representatives of political prisoner groups from various communities. March 1: International Action Center, 39 W. 14th St., #206, New York, NY, 6:30 PM Film showing and presentation at weekly meeting. 2:30 PM - Film showing and presentation, Hill Hall, Room 102, Martin Luther King Blvd.,Rutgers University, Newark, NJ. 7:30 PM – Clemente Solo Velez Cultural Center, 107 Suffolk St., New York, NY, Film Showing and discussion. The New York/New Jersey events are sponsored by New Jersey Solidarity, NY Committee to Defend Palestine, Al-Jisser Group, San Romero de las Americas Church, ProLibertad, Malcolm X Grassroots Movement, Movement in Motion, Student Lawyers Guild and more. March 3: East Lansing, Michigan. Michigan State University. Sponsored by the Michigan State University Students for Palestinian Human Rights (http://www.msu.edu/~divest/palrights) as part of a film series entitled "On Deaf Ears: Films From Occupied Palestine." Contact Palestinian_Human_Rights@yahoo.com. With Producer/Director Buthina Canaan Khoury. Discussion to follow. March 4: Dearborn Michigan. Sponsored by the Arab Student Union at the University of Michigan, Dearborn in coordination with the Palestine Office-Michigan and OnePalestine.org. 4901 Evergreen Rd. University of Michigan University Center Multipurpose Room B. 4 PM. March 9: Harvard Film Archive, 7:00 PM, Screening Room B-04, 24 Quincy Street, Cambridge, MA. Sponsored by NECDP. (The HFA is inside the Carpenter Art Center, which is on Quincy St. just across from the eastern side of Harvard Yard. (For a map with directions and parking information see http://www.harvardfilmarchive.org/map.php). March 15: Bryn Mawr College, Bryn Mawr, PA. Tuesday, March 15th, 7:30 – 10PM. Location: Cambrian Row, Room 101 Bryn Mawr College, 101 N. Merion Ave.
March 21: Virginia Commonwealth University, 7:00 PM. Sponsored by Association of Muslim Women in America. March 23: At the University of Southern California. Sponsored by Students For Justice in Palestine. 6:30 PM .Building #ZHS in room #352. If looking at the map posted on line the building is posted as SHF#352. Palestinian filmmaker Buthina Canaan Khoury will be present to introduce the film and for discussion following. March 31: Jamaica Plain, MA. Spontaneous Celebrationss, 45 Danforth Street. (Near the Stony Brook T on the Orange Line).7:00 PM.Co-sponsored by the Art Collective. With Producer/Director Buthina Canaan Khoury. April 1: Waltham, MA. Brandeis University, Heller Lounge in the Heller School, Brandeis University, 415 South St., Waltham, MA. 6:00 PM.With Producer/Director Buthina Canaan Khoury. April 4: Boston. Mass. College of Art, 621 Huntington Avenue. North Hall, Film Screening Room 1, Mass. College of Art, 8:00 PM. With Producer/Director Buthina Canaan Khoury. More organizing is still in the works for San Francisco, Canada, Chicago and other cities. If anyone is interested in hosting an event for the director please inform Rawan Barakat (rawanbarakat@hotmail.com).